1st appearance of Guy Gardner. Green Lantern #59. (DC Comics). You can judge the photos, I am a comic collector, not a professional grader. (FN ) OFF WHITE PAGES. We make every effort to ensure your goods are received in perfect condition. Plot: 'The Secret Life of Star Sapphire' - Carol finds herself captured by the Zamarons, who have selected her as their new queen. Learning that she is in love with Green Lantern, they equip her with all the power required to defeat him in battle and prove female superiority. Cover Gil Kane (Pencils) Murphy Anderson (Inks). (Colors), ?. (Letters). Feature Story: Green Lantern. Green Lantern [Hal Jordan]; Pieface [Tom Kalmaku]; Dr. Keller; Guardians of the Universe; The Grolls (first appearance; villains). Green Lantern #16. CGC 5.5 Off-White to White Pages. DC Comics, 1962. 1st Appearance of Star Sapphire. Comics are protected using combinations of cardboard, bubble wrap and boxes depending on the number of comics in the order. Check out the pic for a great look---------------------------------------------------------------------------------------------------------------- ----------------------------------------------------- - grade FN/VF. Green Lantern 1 CGC 4.0 | DC 1960 | 1st app Guardians of the Universe! Origin! Up for your consideration is Green Lantern 1 CGC 4.0 | DC 1960 | 1st app Guardians of the Universe! Origin! . Lot of 1 Books containing; Green Lantern 1 CGC 4.0 | DC 1960 | Origin retold. Showcase #23 CGC 3.0 (OW-W) 0360040010 . We are sorry for any inconvenience. For larger credit card orders, proof of identity may be required. International credit cards are NOT accepted. 50,000 square-foot custom facility with over 60 people on staff. Cover pencils by Gil Kane, inks by Joe Giella. Buzzy Says: Free Speech -- Free For All! Many Loves of Dobie Gillis ad, art by Bob Oksner. Letter to the editor from comic writer Roy Thomas. Grade: CGC 1.5. ORIGIN of Green Lantern retold! 1st Appearance of The Guardians of The Universe!Beautiful CGC 2.0 (GD) example - Off/White to Cream Pages with Excellent Gloss quality! Green Lantern #1 DC 1960. Boxed and well cushioned with cardboard and bubble wrap/newspaper. Artists: Gil Kane, Joe Giella (inks), Murphy Anderson (cover inks). 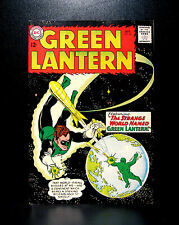 Appearances By: Flash (Barry Allen), Green Lantern (Hal Jordan). Issue: #20 Cover Date: April, 1963. 75p for each comic after. GREEN LANTERN #52 CGC 9.0 -- WHITE PAGES! GOLDEN AGE LANTERN APPEARANCE! Green Lantern #52 CGC graded in 9.0 condition! Cover by Neal Adams. This is the Way. The World. Ends!, script by Denny O'Neil, pencils by Jack Sparling, inks by Sid Greene; Green Lantern is pulled into the distant past by a mad alien scientist who wants to wipe out Earth's long history of war and suffering by preventing all life from developing in the first place. All parcels will automatically be covered for up to £50 value. 10-12 Comics £8.40 £13.90. Cash on Collection. # of Comics. 24-25 Comics £25.70 £31.20. 20-23 Comics £22.80 £28.30. Gardner Fox (Script), Gil Kane (Pencils), Sid Greene (Inks), ?. (Colors), ?. (Letters). -------Cover Gil Kane (Pencils) Sid Greene (Inks) ----------------- -----------------------. Perils of the Powerless Green Lantern. Cash on Collection. All parcels will automatically be covered for up to £50 value. 24-25 Comics £25.70 £31.20. 20-23 Comics £22.80 £28.30. 17-19 Comics £19.90 £25.40. Green Lantern #59 CBCS 9.2 (OW) 17-144D1AB-002 . We are sorry for any inconvenience. For larger credit card orders, proof of identity may be required. International credit cards are NOT accepted. The world's largest source of trading cards and collectibles. Green Lantern #41 (D.C. - 12/65) HIGH Grade - FIRST PRINTING. 3rd appearance of STAR SAPPHIRE - Silver Age KEY ISSUE! TINY WATER STAIN BACK COVER (TOP RIGHT) & BARELY VISIBLE WATER STAIN FRONT COVER BY TOP STAPLE. Cover pencils by Gil Kane, inks by Joe Giella. Buzzy Says: Free Speech -- Free For All! Many Loves of Dobie Gillis ad, art by Bob Oksner. Letter to the editor from comic writer Roy Thomas. Grade: CGC 0.5. "1st Appearance of Tattooed Man!". Green Lantern #23 DC 1963. (1st App of Wolverine) Incredible Hulk #181. (1st App & ORIGIN of Daredevil) Daredevil #1. (1st App & ORIGIN of Moon Knight) Werewolf By Night #32. 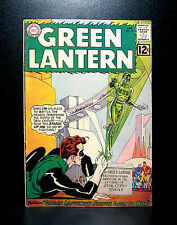 2nd Appearance of Silver Age Green Lantern. CGC 6.5 Off-White Pages. DC Comics, 1959. Showcase #23. Comics are protected using combinations of cardboard, bubble wrap and boxes depending on the number of comics in the order. Auction is for CGC graded comic freshly back from the grader. Packed with utmost care. Please see full description. Please see pictures for details. Ships fast. PAPER SCRAPE FRONT COVER.STAINING THROUGHOUT. 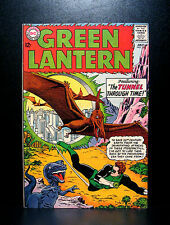 Green Lantern #20 April 1963 The Flash! Green Lantern #7. (DC Comics). You can judge the photos, I am a comic collector, not a professional grader. (FN) OFF WHITE PAGES. 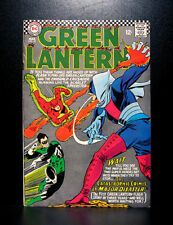 Listed for sale is; Green lantern #14 VG £20.00. 2cm spine split! We have over 30 years of experience in the industry, serving both UK and USA markets. By having your Comic book signatures authenticated, graded, and certified by CGC you will able be prove that the signature is 100% official. 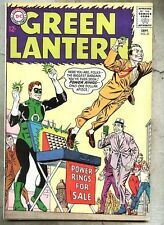 GREEN LANTERN #16 Key Book! (VG/FN) Bright & Colorful! A nice little book.flat, square, bright & colorful. 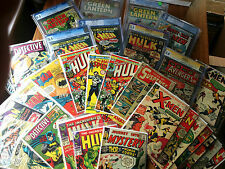 I 've been a comic collector and dealer for 40 years. Ask for price. inventory filing code: Ttown. TYPE WHAT YOU'RE LOOKING FOR IN THE "FIND" WINDOW UP TOP. Green Lantern #17. (DC Comics). You can judge the photos, I am a comic collector, not a professional grader. (FN) OFF WHITE PAGES.